Back to Lay – we only needed to trade at 10 and he traded at 10.5 as a BSP and 7.6 in running!! Betfair – How to use it to make MONEY – we take a look at using SUPPORT LEVELS. This is a practical guide using a real life example will help you identify support levels and how you can then exploit them to make money. Has to have a major chance here in a weak affair now with Oisin Murphy back in the plate. The selection has improved since joining this yard & going handicapping; unlucky not to win over C&D last time out & has a much better draw now. This horse is a different animal when racing at Southwell. Upped 12lbs for a facile win he went on to complete a double NTO and now is off the same mark. Crosse Fire, who was well beaten in that race, has since come out and won at this course. The reason he is up for a back to lay is that he will have competition for the lead today from Global Melody and that might take it’s toll coming into the last 1/2f and leave the way open to a hold up type like Newstead Abbey. I still think this is a great opportunity for the treble but will be looking to get out around the 1f pole unless it’s clear he will win. Currently trading at around 2.0 our unique “Back to Lay Staking Calculator” will advise you to lay at 1.33 to get 50% return guaranteed on your money. 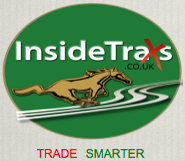 You can download the Excel spreadsheet with the “Back to Lay Staking Calculator” for FREE at www.InsideTraxs.co.uk it’s on the bottom of the homepage; with our “Weight of Money Calculator” and our “Weighting Calculator” – which tells you if a horse is over or under weight in the betting – also there for FREE download..
Has run once on this course over a furlong further. Ran green and only headed in the last 100 yards gives belief that he will run better this time and over a shorter trip. However this is a poor race and there are others that wouldn’t have to be anything special to win this. Lofty doesn’t deserve to be anything close to odds on. LAY at 2.0 or less. Career best win at this C&D LTO. David Probert takes over from Martin Harley and I believe that this Alan King horse has a great chance of winning but at 2.14 for a top 3 place this is almost a certainty (I know certainties don’t exist!! ).